The Tignes Chalet Company Blog - Chalet Accommodation Tignes: The snow is coming! Autumn is always an exciting in Tignes, with the changing colours of autumn which often include an occasional blanketing of the white stuff. 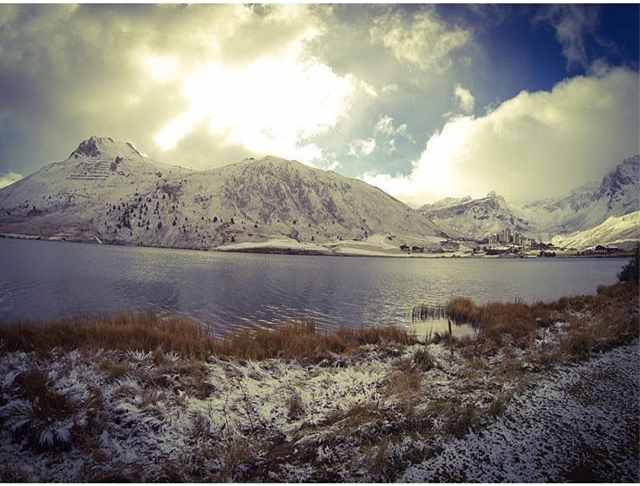 In fact we have already had snow down to the village at 2100m in Tignes as you can see above. And there is more snow in the forecast with the freezing level to drop as low as 2300m bringing some snow just above village level on Monday, and the forecast is for the freezing level to stay well below 3000m for the rest of the week which is good news for the glacier. There has also been snowfall elsewhere in the alps. 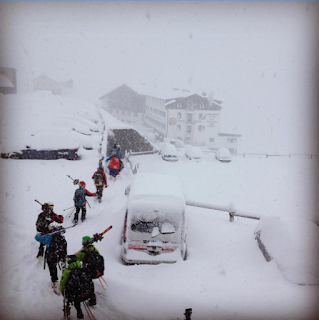 This picture was taken by a friend of Ultimate Snowsports at her race camp base in Stelvio, Italy. The picture was taken at around 2600m and as you can see the snow was really starting to accumulate at this altitude, really amazing but maybe not such great conditions for race training!